It might be incredibly hot where you live right now, and, if that's the case, I apologize for posting a soup recipe. But its one I love, and it's the sort of thing I like to take for lunch at the studio. Also, I live in San Francisco, and it's nearly always sweater weather - 58F. The soup: the base is yellow split peas incorporated into a ginger-spiked yellow coconut curry broth (lots of turmeric). It's filled with flavor, and substance - with a good amount of protein to get you through the afternoon strong. 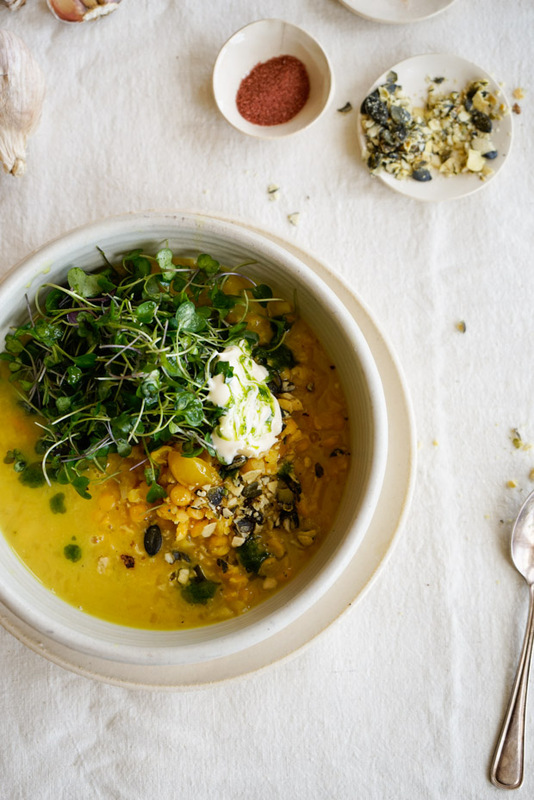 You get an added bit of summer and sweetness from yellow cherry tomatoes, and vibrant chive oil, toasted seeds, and some micro greens take the whole bowl over the top. Give it a try - you can transport the soup in one jar, and toppings in another. A vegetarian take on what I think of as the Chinese chicken salad of my youth. I love so many components of that salad, the crunchy peanuts, the thin, garlicky sweet dressing, the green notes of cilantro and scallions in there with the salad and cabbage. In place of shredded chicken, I'll pack a hard-boiled egg, or a bit of pan-fried tofu to make a one bowl meal of things.